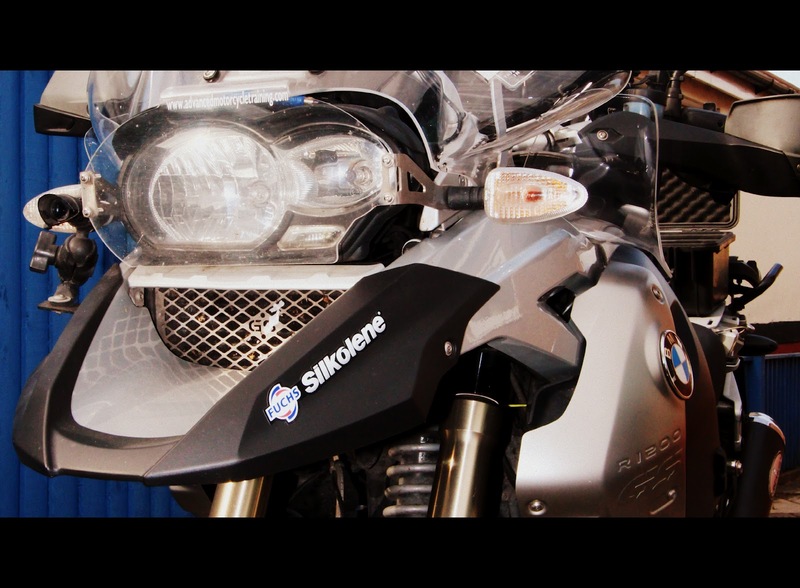 Well I decided to fit a Pelicase 1300 to my BMW R1200GS to replace the rear pillion seat. Why ? Well I do not carry pillions and suffer from of having sufficient storage on the BMW for anything other than the toolkit under the seat. I have my Autocom fitted in that place under the seat. The Pelicase is fitted to a plate which clicks into position and I have fixed the case to the plate with four bolts. I thought of fitting a Pelicase 1400, which is shorter in height but bigger on the base. Thought the Pelicase 1300 looked better. Well I needed to find a way of powering the three on board video cameras, and more importantly make it easier to take the whole 'unit' off the BMW. I decided the fit some power sockets on the back and on the front of the Pelicase. The rear socket is powered from the auxillary power sockets under the seat. The front is the regulated supply powerlet socket to the cameras. I just need to design a cover so I can put the radio in the box aswell. That is one reason I have 'plumbed' the Autocom lead into the box. The old system was hard wired and the new way gives me more flexibilty.